Set in a peaceful valley in the Peak District National Park, the Old Farmhouse dating from the 18th Century is listed and is full of character. The valley is steeped in Archaeological history dating back to the Neolithic, Bronze Age and Roman periods. 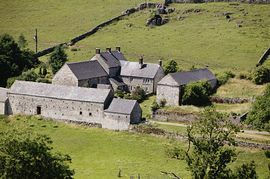 The Grange is built on the site of a mediaeval monastery, the ruins of which are located 200 yards further down the valley. 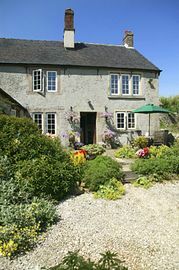 Roystone Grange is centrally located to enjoy the attractions of the Peak National Park. It lies in between Buxton, Ashbourne, Matlock and Bakewell. Contains a well equipped kitchen, lounge/dining room , a quiet study/reading area. Also there is a good sized pantry and W.C. on the ground floor. Stairs lead to two bedrooms; one with two singles able to be made in one seven foot, double on request. The main bedroom has a king-sized, four poster bed and occasional seating. A folding bed can be installed into either room on request. The bathroom on the adjoining landing has a bath with shower and toilet. Contains a fully equipped kitchen/dining room, lounge with wood burning stove, also a cloakroom, utility room and boot room on the ground floor. The central stairs lead to the first floor; the main bedroom with antique king size bed is very spacious and has occasional seating. The bedroom has an en suite bathroom with bath and shower over, hand basin and toilet. Also on the same floor the second bedroom with a king size antique bed, en suite shower room with toilet and basin. On the second floor is a further bathroom with bath and shower over, hand basin and toilet, also the two remaining bedrooms. One has twin beds, which can be joined together to form a King size bed. The remaining bedroom has a further double bed and an occasional bed which slides out from underneath. 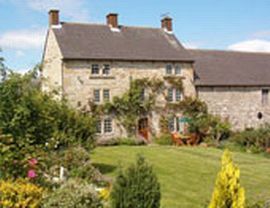 Two large early Georgian Stone buildings with comfortable relaxing accommodation. 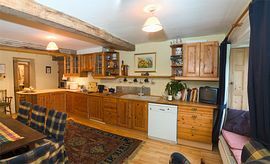 Situated in a peaceful valley in the Peak District in rolling open countryside. We are located mid way between Ashbourne and Bakwell, 4 miles East of Dovedale and between the hamlets of Pikehall and Ballidon shown on National Road atlases. Roystone Grange is marked on the Buxton, Matlock and Dovedale area O.S maps. Take A515 towards Buxton. After 1.9 miles turn right at the Bentley Brook pub onto the B5056 towards Bakewell / Longcliff / Ballidon and Grangemill. After 3.4 miles turn left, signposted Ballidon & Parwich. Take first right, signposted Ballidon. Through Quarry over cattle grid and onto farm track. Continue along farm track through gate and onto Roystone Grange. Take A6 towards Matlock. After passing Haddon Hall, turn right onto B5056 towards Ashbourne. Take first left, still on B5056 heading towards Ashbourne go straight across at Grangemill cross roads (Hollybush pub on corner) After 4.5 miles (from Holly Bush pub) turn right, signposted Ballidon and Parwich Take first right, signposted Ballidon. Through Quarry over cattle grid and onto farm track. Continue along farm track through gate and onto Roystone Grange. As rates vary throughout the year please visit our website for details.